Student Isabella Scott presenting her project, Perfect Performance Garments. Photo by Kasia Broussalian/New School. “I’m worried the musicians will stuff their pockets with junk.” Marin Alsop, music director of the Baltimore Symphony Orchestra (BSO), was sitting in a corner of the Sheila C. Johnson Design Center at Parsons The New School for Design as she said those words. Surrounding her were Joel Towers, executive dean of Parsons The New School for Design, and Richard Kessler, dean of Mannes College The New School for Music, along with students, staff, and businessman Tomio Taki, a Parsons board member and Alsop mentor. Visuano, developed by Quiyi Wu (MFA D+T), Boshan Zhou (MFA D+T), Yinan Zhang (Visiting Scholar). This presentation was a chance for the students to show their designs to Alsop for feedback as they worked toward final prototypes to be presented at the semester’s conclusion. Some students reimagined the musicians’ apparel with an eye to increasing comfort and range of motion. Scott and Chon created a jacket combining a stretchy, elastic-like backing to facilitate musicians’ broad movements with a lighter fabric to minimize sweating. They did away with the traditional tails, which they’d noticed tended to cause the performers’ jackets to ride up uncomfortably during a performance. During a class visit to the BSO’s home in Baltimore, the pair observed the orchestra musicians at work and also spoke to the performers. That is what led to the pockets that Alsop worried about—some of the woodwind players complained that the current, pocketless tuxedo jackets left them nowhere to store their spare reeds. Alsop was concerned that a full pocket might spoil a player’s silhouette. Student and guest, designer and client, agreed to shelve the discussion of pockets for another day. Other student projects were designed to enhance the visual aspect of the audience’s experience. 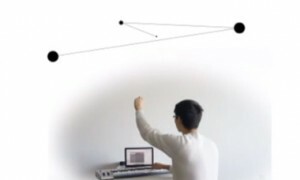 Quiyi Wu and Boshan Zhou, from the MFA Design and Technology Program, and visiting scholar Yinan Zhang designed a projection to appear above a pianist: a pair of dots that dance along with the musician’s movements as well as his or her strokes on the keyboard. Alexandra Zulkoski, BFA Communication Design, and Carla Marin, MFA DT, designed a bracelet incorporating a motion-tracking device, to be worn by the orchestra conductor; the conductor’s motions are reflected in the movement of a flock of digital birds or a series of projections on the outside of the orchestra’s building. Jeremy Peterson, MFA DT, and Ross Leonardy, BFA IDP, also use motion-tracking devices, but attach them to the performers, to create striking visual elements that play across the ceiling of the performance hall and also generate detailed data on the musicians’ performance to help them analyze their work. Glendon Jones (MFA DT) took inspiration from the avant-garde for his project, an otherworldly, vaguely Tim Burtonesque partially robotic violinist costume with gigantic, bulbous arms and a long, lean skirt equipped with toes that can tap in time to the music. The students present their final prototypes in December. In the meantime, you can see videos of their work on YouTube.